Sorry, I had to do it. It’s been on my mind for a couple of weeks. With this morning’s week 16 weigh in, I officially cracked the FIFTY POUND MARK! My weight today is 294.2, down 2.2 pounds from last week. Since the start I am down 50.8 pounds, or 14.7%. AIC – was 7.1, now 5.7!!!! According to my doctor, I am NO LONGER DIABETIC! She is going to monitor my A1C for a while, I get it re-checked in 3 months, then see her again on December 19. She asked me about my knee pain, and I told her that it only rarely ever hurts. Then I realized, I answered in the singular. Where both knees once hurt, it is now only my left, and only when it has been in one, cramped position for too long. Knee pain from activity is a thing of the past for me. With the cracking of the 50 pound barrier, I thought I would show a couple of “during” pictures. This past weekend my nephew got married. The before pictures are from a wedding I attended last fall, and the “during” pics are from this past weekend. 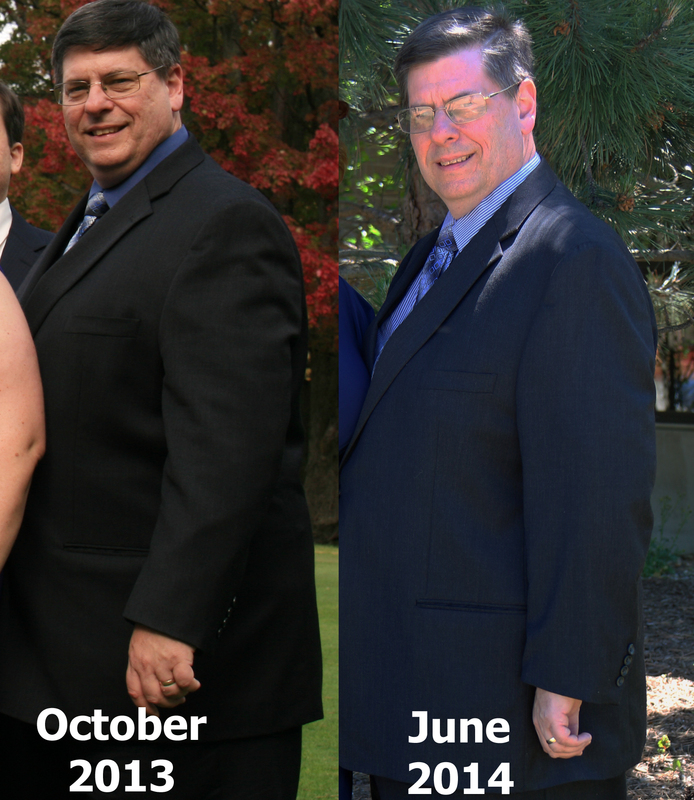 I am wearing the same suit in each, which had to be tailored for the event. The second obstacle was that the fitness floor at my gym has been closed all week. This is the area with the weights, treadmills, ellipticals, stationary bikes and so on. They needed to re-carpet the area, and closed it for 5 days. It will re-open this weekend. I could have gone to another franchise in the chain, but the next nearest one is about 10 miles away, and to get there I’d have to navigate through a particularly nasty bit of traffic caused by a long-term road construction project. I was able to still lose this week by walking at work, and staying true to my daily point totals. I feel really great today. I am motivated to do more. Next week I can get back to my gym schedule, I will stay on my points, and am looking forward to the rest of this summer being one filled with a lot of activity, and one in which I feel great! ← Failure is an event, and does not define me. 14.7% of your beginning body weight is gone, that’s awesome!!! Congratulations on your hard work and dedication. I don’t know if I would have the will power just yet to go to a wedding with good food and drinks and manage to stay in my points for the day. I would have seen it as my cheat day from the moment I woke up! Keep up the good work! Oh, by the way, I notice that your smile seems to be getting bigger as you get smaller! As far as the wedding goes, I look at it this way, there is great food around all the time. Why would I break my new habits there. I sampled and I tasted. I got the full experience, without the experience of being full. And as for the smile, thank you! I feel REALLY great these days. Holy cow! That’s great, Bob! This is very inspiring. Thank you for sharing. You’re doing it!!! Congratulations Bobby! 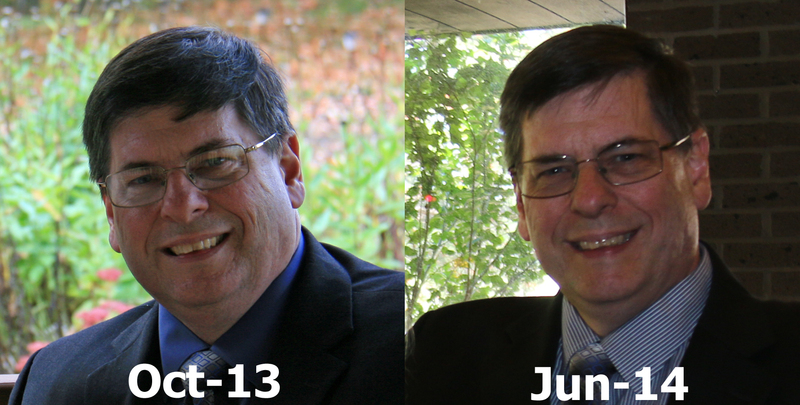 I too was able to rid myself of Type II Diabetes and it was the most wonderful feeling. Good for you for staying on plan, even in the face of tremendous temptation! My doctor is not the huggy type, but when she told me I was no longer diabetic, she very nearly got a hug. Instead she got a firm, two-pump handshake. I was pretty darn excited about it. Wow, so well done! Thank you for sharing this post. Gives me a lot of hope.